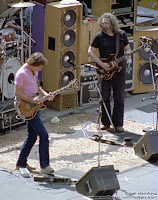 1982 sits smack in the midst of probably the darkest stretch of the Grateful Dead's musical career, fame-wise. By '82 the 70's Classic Rock thing had significantly worn off its claim on popular music, and the band was still a number of years away from its full re-immergence into popularity to come later in the decade. Nestled into the quiet earlier 80's, 1982 often holds surprisingly archetypical musical representations of the Grateful Dead. While it doesn't top many (if any) favorite year lists, it's one of those years where you can be rewarded by doing nothing more than randomly selecting a date and giving it a spin on the stereo. 1982 is well worth exploring. August 10, 1982 was actually the very first tape I pulled out when I decided to begin the Dead Listening project. It made no sense--I'm a 1973 fan through and through--but for some reason, after many years away from the Dead's music, this date was the first to call to me as I stared at my wall of CDs. In my time away, my mind had gotten very fuzzy regarding the Dead's musical history. The ability to look at a tape or CD and instantly recall the musical memory of its highlights was nearly extinguished. Yet when I saw this date, I remembered a wonderful Eyes of the World, and a delicious sound quality to the recording. So 8/10/82 was the first show I loaded onto my iPod. I had a mixed listening experience, not because the actual show was disappointing, but probably because returning to the Dead's music after so long kicked up a significant amount of dust. In an odd way it felt like I was listening to the music through a thick clouded glass window. I'm not sure why I didn't get to reviewing this date earlier. Lord knows I've let my ears dabble back into this tape many times. Now it seems to fit in nicely. Pretty much my first take away from this show is how interesting the first set list looks on paper. Friend of the Devil in the number two spot, an always welcome It Must Have Been The Roses, and the first of only two times we saw the pairing of On The Road Again into Beat It On Down The Line (the last came two months later). A tune that could be worn as a badge of 1982 in many ways, Feel Like A Stranger is completely satisfying as the show opener. It bobs and weaves, brimming over with the very essence of the band's sound. More and more as I listen to this audience recording I am struck by how pristinely this sounds exactly like the Grateful Dead. I know that's sort of a goofy thing to say, but maybe you'll get my point as you listen. The taper, Kenny Mance, is FOB (in Front Of the sound Board), and from that position in the 4th row Garcia's guitar in particular outdoes itself in conveying precisely those characteristics which epitomized his sound completely. That deep richness coupled with his signature twang and sizzle-pop high-end just oozes from this tape. 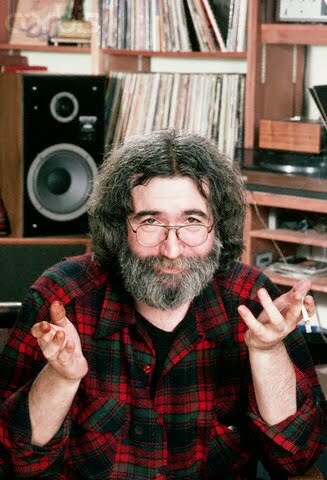 At first I thought this impression about Jerry's sound was just due to my absence from the band's music, but the quality is as clear now as it was nearly two years ago when I first returned to the tape. It makes the entire listening experience more enjoyable and intimate at the same time. With Friend of the Devil following the opening Stranger, I'm sold. Immediately I'm transported directly into my Grateful Dead "happy place." And the set rolls along ever so nicely. Cassidy threatens to drop the train off the rails into a storm filled psychedelic sea below the tracks. And even as it becomes clear that something has gone critically wrong with the entire PA system in Roses, it almost doesn't matter--so potent is the familiarity of the band and its audience here in '82. We're all completely comfortable and at ease. Technical difficulties simply don't matter. Well, they matter to the band and crew, thankfully. While things are getting duct taped back together to make it through the set, Kenny continues to let the recording roll. There's some guy calling out for the band to let Phil sing and shortly after they unleashes an impromptu detour fully into Space--perhaps at a loss to come up with something else with which to test the PA, or maybe sparked by some vocal feedback. It comes out of nowhere and adds a twisted accent to an otherwise lull in the action, and proves that the sound system is back on its feet. There's even a wonderful little Tico Tico tuning just before they make it into On The Road Again. All in all this is one of the most satisfying "technical difficulties" you could ask for caught on tape. The second set leaps out of the gate with a nice China > Rider. It's a musical selection that did not lose a step moving from one decade to the next. The transition jam is full of spinning kaleidoscope colors which slowly manage to congeal into the structure of I Know You Rider, with wonderful sparkling solos trailing out of Garcia all the while. After a respectable Sailor > Saint--another staple of the early 80's--we transition into Eyes Of The World. It's played at a rapid tempo, and Jerry rushes into the first verse, but not before laying down some extremely enticing licks to start things off. The song just blossoms from there. Bobby is a master of syncopation while Garcia splashes and flourishes in rainbow brushstrokes. Again, I'm thoroughly consumed by how Jerry's tone bursts at the seams. As he flies over hills and up into the clouds, his guitar stands as tall as trees. It all ends too soon, as far as I'm concerned. The Drums and Space which follow feel a tad underplayed. The Space only seems to briefly reach the roaring chasm that was hinted in the first set. Still enjoyable, it isn't quite as monumental as many from 1982 could be. The end of the set seems standard on paper, but it's definitely worth the listen. From the infectious Aiko Aiko to the way Stella Blue manages to gently throb like a massive tide of stars washing slowly in and out of your mind's eye through the final solo section, there is plenty to enjoy. 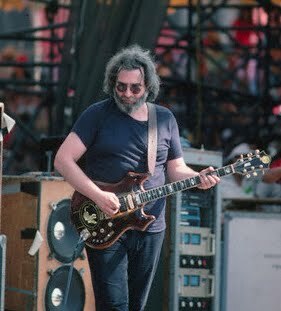 Not to mention, who can avoid applauding the band from barely avoiding a train wreck (maybe not so barely) as Garcia slams out of Stella into Around & Around, only to have the rest of the band head into Sugar Mag. Ah... we love you guys, warts and all. An "It's All Over Now, Baby Blue" to lead off a two song encore is just icing on the cake here. Again, a lovely AUD recording ushers us in to another great show.